How to Turn Dirt Into Gold ~ Folktale Stories for Kids No Reviews Posted. This is the Folktale Story of "The Old Alchemist". It has been re-imagined into the folktale of "How to Turn Dirt into Gold". It is brought to you by Stories to Grow by. If you ever wanted to turn dirt into gold, you are not alone. Years ago, many people spent a lot of time trying to do this. They were called by a long name - “alchemists.” Yet none of them could really pull it off. After all, who can really turn dirt into gold? You may be surprised to learn there is a way. Hear this story and find out. Long ago in a country called Burma, in Asia, there lived a young wife. She loved her husband very much, but one fear was heavy on her mind. “If we live that long,” said his wife in a quiet voice. She knew she needed help, and so she went to her father’s house. “Thank you!” She felt better already. The next day, the father went to see his daughter’s husband. “I hear you are trying to turning dirt into gold,” he said to the young man. “You were?” said the young man. “I do,” said the old man. “But by then I was too old and it was too hard for me to carry it out. I did not know anyone younger I could trust.” He looked at his son-in-law right in the eye. “You can trust me!” cried the young man. He jumped up with joy. Smiling wide, the two of them shook hands. Then the older man told his son-in-law about a silver powder that grows on the back of banana leaves. Seeds for the bananas must be planted in the ground while the words to a special magic spell are said. When the plants grow tall and ripe, silver powder from the back of the leaves must be brushed off and saved. “How much of this silver powder is needed?” said the young man. “Two pounds,” said the father. “But that will take hundreds of banana plants!” cried the young man. With the loan, the young man rented a large plot and cleared the land. He planted the seeds while saying the magic spell over them that he had learned. Each day, the young man walked the rows of young plants. With great care, he pulled out the weeds and kept the pests away. When the banana plants grew tall and ripe, the young man brushed the magic silver powder from the back of their leaves. But only a handful of the powder could be saved. He had to buy more land and grow more bananas. It took a few years, but at last he had the two pounds. With great joy, he ran to his father-in-law’s house. "I have enough of the silver powder!" he cried. With great joy, he ran to his father-in-law’s house. "Great!" said his father-in-law. "Now I will show you how to turn dirt into gold! But first you must bring me a bucket of dirt from the banana farm. And you must bring my daughter - she is also needed." The young man did not understand why, but he ran to the farm and dug up a bucket of the dirt. Then got his wife at home, and the two of them went to the old man’s house. The father asked his daughter, "When your husband was saving the banana powder, what did you do with the bananas?" "Why, I sold them," she said. "That is how we have been able to live." "Did you save any money?" asked the father. "May I see it?" said the old man. The young woman and her husband gave each other a quick look – this was odd! But she went home and came back with a large bag. The father saw that inside the bag were gold coins. “Set that down,” he said. Then he took the bucket of dirt and dumped it onto the floor. He took the bag and poured the gold coins in a pile, next to the dirt. "You see," he said, turning to his son-in-law, "you have turned dirt into gold!" The young man said, "What?" "Oh, I get it!' said the daughter. "My dear," she said, turning to her husband. "You farmed the dirt, and then we sold the bananas. Now we have gold coins!" "But that is not the magic I had in mind," he said. The daughter gave her husband a kiss on the cheek, and she smiled. "Well," he said, "maybe there is some magic here." "Indeed," said the father. "Now let's eat!" And the three of them sat down to a good, tasty dinner. 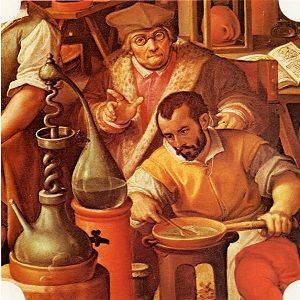 The see the Original Folktale: The Old Alchemist, Click Here! This story is part of our "Folktales Reimagined Collection: Moral Stories for Kids from Around the World. It has been adapted from our story "The Old Alchemist" ,which is based on a story of the same name from In the Ever After: Fairy Tales and the Second Half of Life, by Alan B. Chinen (Chiron Publications: Illinois, 1989) pp. 31-33. Retold by Elaine Lindy. ©2018. All rights reserved.